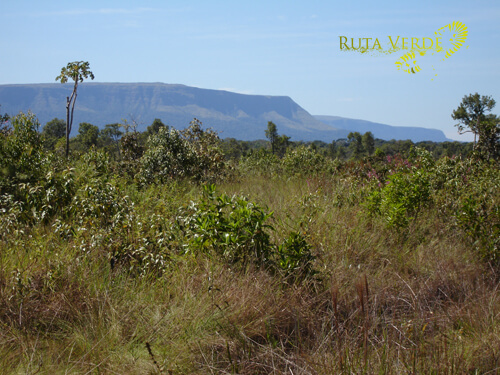 One of the main attractions of Noel Kempff Mercado National Park is the Caparú Plateau, a Precambrian sandstone table mountain that rises abruptly from the thick rainforests approximately 1,800 feet to an elevated plain of grasslands and cerrado woodlands. The plateau was first described by the legendary British Colonel explorer Percy Fawcett who discovered the plateau in 1910. Later, his descriptions were used by Sir Arthur Conan Doyle for his book ¨The Lost World¨. The Paragua river with its dark waters and El Encanto waterfall where you can observe the rare black spider monkeys climbing the rocks are a few samples of the many different attractions part of this expedition to the South side of Noel Kempff N.P..
4000 species of flora, more than 620 species of birds, 130 species of mammals, 127 species of reptiles, 62 species of amphibious and246 species of fish. National Park declared ¨Natural Patrimony of Humanity¨ by UNESCO. The flight will take about 2 hours. Florida is a small community (about 20 families live here) on the border of Noel Kempff N.P.. We will have lunch in Florida. We may spend the night in Florida (in that case you can go for a canoe tour or a bike ride in the afternoon) or we made head off in the afternoon to the camp site Los Fierros, about 35 km from Florida. Los Fierros is closer by the main attractions in the park which are the Caparu Plateau (table mountain) and the waterfall El Encanto. Early in the morning we drive towards La Meseta , followed by a 4-hour hike that traverses both humid and deciduous forest habitats on the lower slopes of La Meseta. Walking up La Meseta , you will have spectacular views of the lowlands surrounding La Meseta. La Meseta. La Meseta is a spectacular 100×60 km rock/platform (80% belongs to Bolivia ). 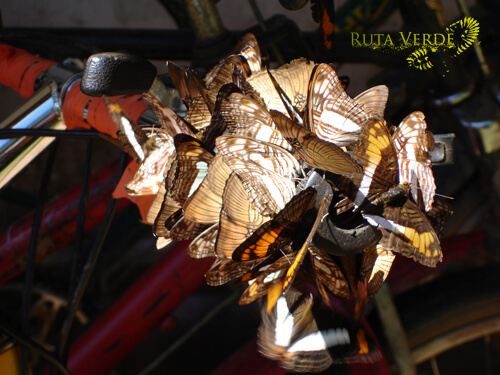 From the Meseta there are impressive views of the tropical forest and pampa with islands of forest. 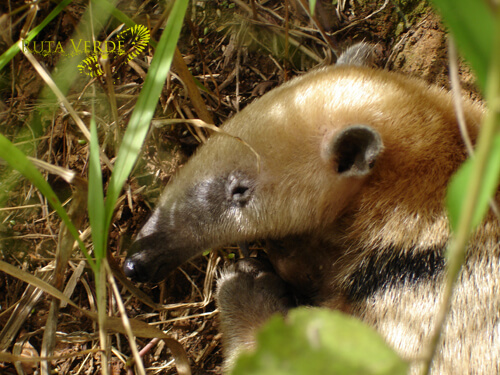 There are some places appropriate to observe potential fauna (Specially early in the morning and at sundown): gama (white tailed deer), ant eaters, pumas and other large mammals like tapirs, peccaries, jaguars and maned wolves seen with some frequency. If possible we will spend the night on the Meseta. Early in the morning we will walk back to where we left the car (approx. 4 hours) and drive to Los Fierros. We will have lunch here. 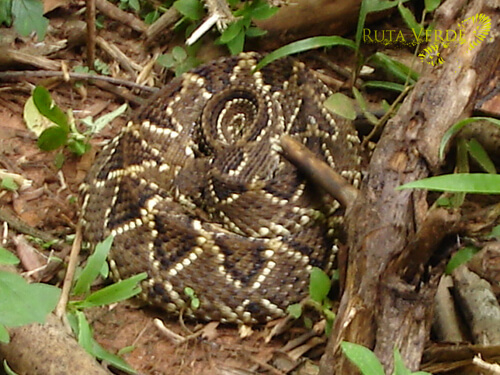 In the afternoon there is time to explore the forests and expansive grasslands found close to the lodge. We will spend the night in Los Fierros. In the morning we will drive back to the community of Florida. We will have lunch in Florida and afterwards we will fly back to Santa Cruz. 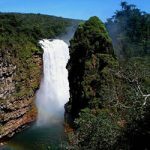 It may also be possible to visit waterfall El Encanto in this 4 day program. It depends on the infrastructure in the park. Of course it is possible to extend the 4 day program in the park. Please take a look at the Noel Kempff packing list. We expect from you to keep the physical impacts on the park’s natural resources to a minimum by respecting the flora and fauna sharing this beautiful place on Earth with us. DAY 1 Santa Cruz – Concepción. 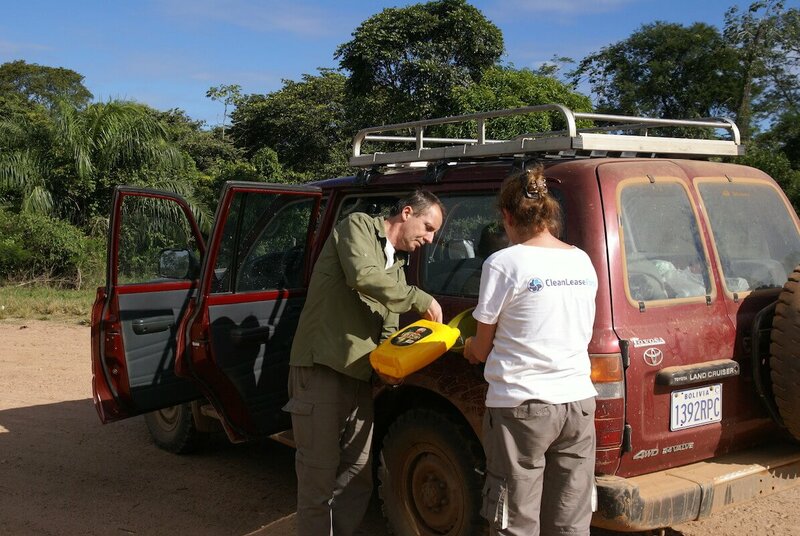 Departure at 08.00 am to Concepción (passing by the Jesuit Mission San Javier), by 4×4 vehicle; This trip will take approx. 8 hours including lunch time and visit to the church of the Jesuit Mission of San Javier. We leave at about 8:00 am to Florida. This is an ecological transect spanning savannas, dry forest, and Amazonian forest. Along the way, you will see new migrant colonist villages and modern cattle ranches; the threat to biodiversity and the reason the park is so important . 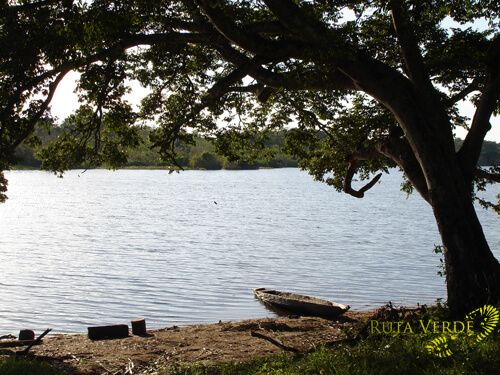 We will spend the night in the community of Florida where you can take a canoe tour in the easy waters of the river Paraguá. You can also fish if you like. Early in the morning we drive 40 km to La Meseta , followed by a 4-hour hike to that traverses both humid and deciduous forest habitats on the lower slopes of La Meseta. Walking up La Meseta , you will have spectacular views of the lowlands surrounding La Meseta. This night we will sleep in tents on La Meseta. 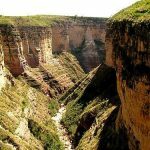 La Meseta is a spectacular 100×60 km rock/platform (80% belongs to Bolivia ). 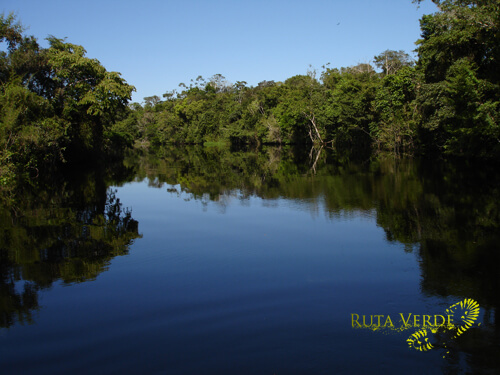 From the Meseta there are impressive views of the tropical forest and pampa with islands of forest. 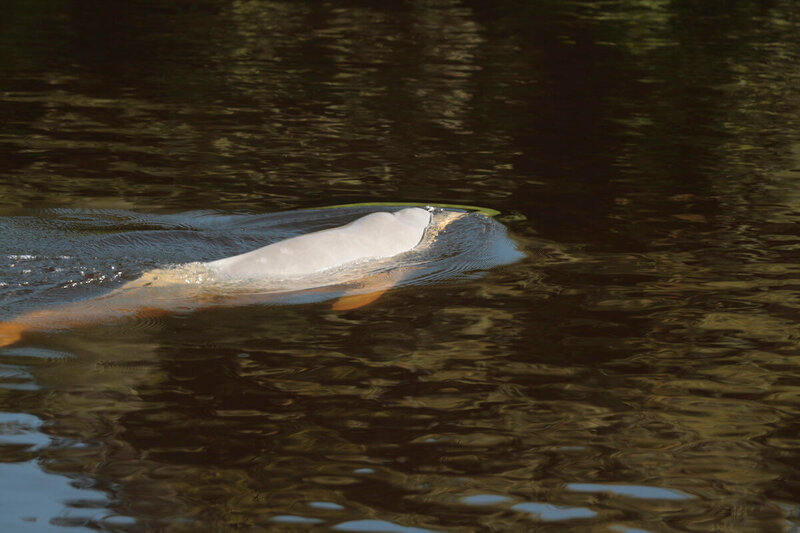 We will hike to and swim in spring-fed creeks and pools; There are some places appropriate to observe potential fauna (Specially early in the morning and at sundown. ): gama (white tailed deer), ant eaters, pumas and other large mammals like tapirs, peccaries, jaguars and maned wolves seen with some frequency. 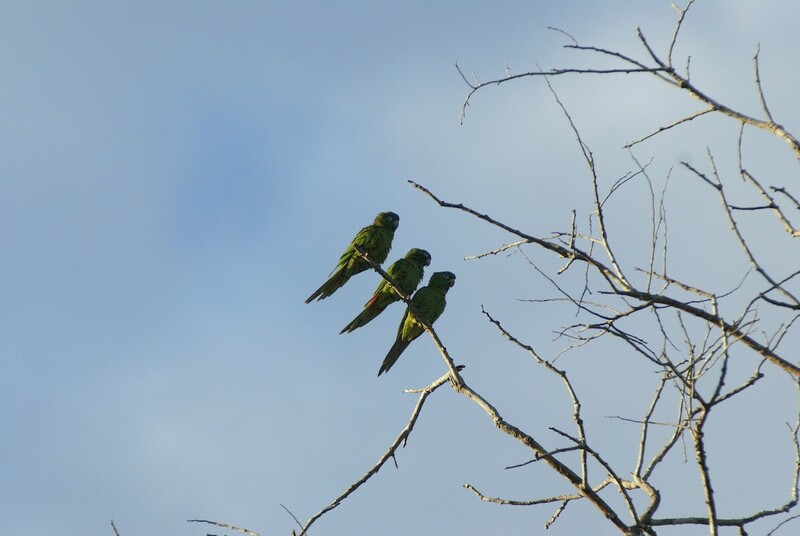 Observe blue and yellow macaws on daily migration from palm swamp nesting sites to feeding ground in lowland forest to the west of the Meseta. Later this day we will take off to the camp side Los Fierros. 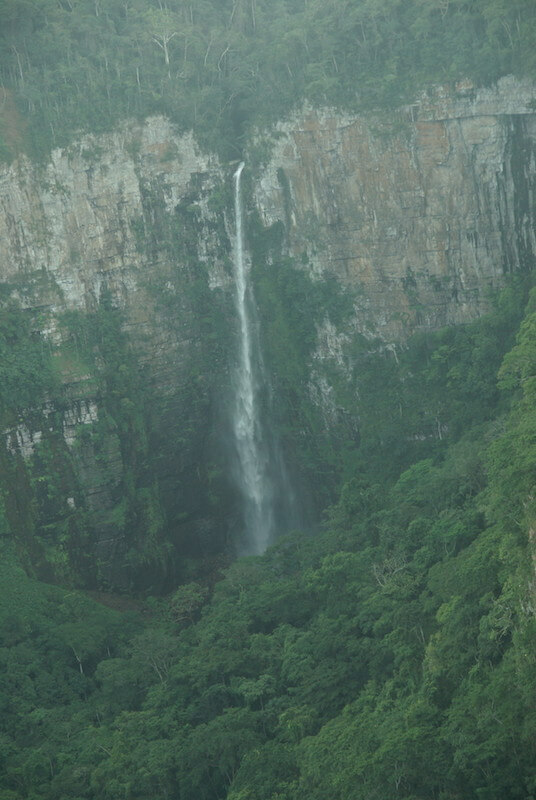 Or depending on the time/your wishes/ energy left, we will drive to the camp side of the El Encanto waterfall. Early in the morning we will drive towards the camp side Los Fierros. 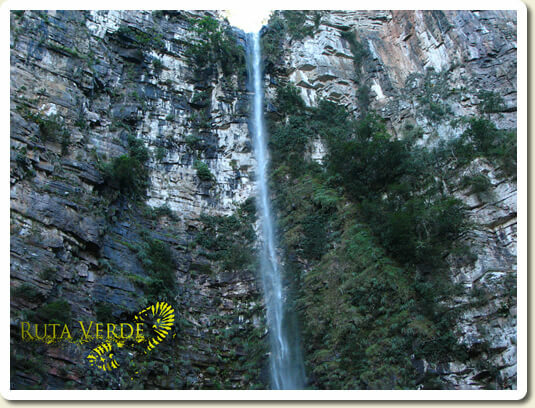 From there it´s about a 5 km walk towards the waterfall El Encanto. By the waterfall we will take a break, relax and enjoy the beauty of this place, bathing and swimming in crystal clear waters at foot of the 80 m waterfall. 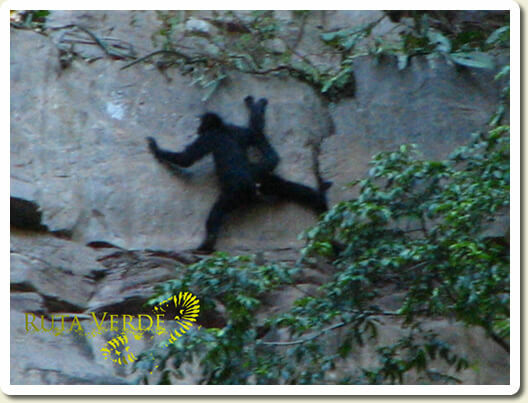 Often you can see spider monkeys climbing up the cliffs. Afterwards we drive back to Florida where you can make a canoe trip in the tannin-stained waters of the Paraguá River. At night you can fish (piranhas and other fish). The canoe trip and the fishing can also take place the 2 nd day. We start our return to Santa Cruz via Concepción (approx. 9 hours). Return to Santa Cruz (approx. 6 hours). The best season do take this tour is the dry season (May – November). The rest of the year we have to check first the weather and road conditions to see if the tour can take place. Due to the already mentioned conditions, the reference program might vary, this always in the best interest and safety of our clients. Please keep in mind that travelling to Park Noel Kempff Mercado is more like an expedition than a tour. Many of travel to the Park takes places over unpaved roads.